Military drones: Is coverage of the DOJ white paper overblown? 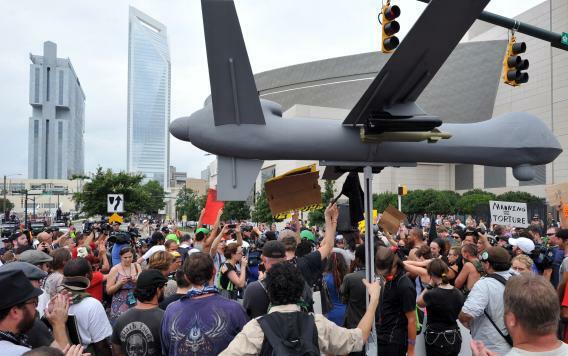 Protesters carry a replica of military drone plane during a demonstration in Charlotte, North Carolina, September 4, 2012 ahead of the opening of the Democratic National Convention. Other writers at Slate are going to tackle this topic in more depth, but—and I’m ready for commenters to drub me on this matter—is the coverage of the leaked DOJ white paper on drone killings slightly overblown? I’m not disputing the newsiness of the memo. Nor am I disputing the hypocrisy of Barack Obama, who joined other Democrats from 2004 through 2008 in denouncing the reasoning that once justified torture and now justifies the killing of U.S. citizens. Hypocrisy is the story of the Obama administration’s continued anti-terrorism campaign. That’s not new. No, I wonder if it’s overblown to suggest that the memo justifies a broadly-defined, extralegal killing of U.S. citizens. Thank God for the skepticism of government that raises the question, but let’s also read the memo. To fit the standard, an American needs to be 1) part of al Qaeda or 2) part of a co-belligerent organization, and “actively engaged in planning operations to kill Americans.” Actively, for the purposes of this memo, doesn’t mean “shooting at an American, at that moment.” Imminence, in general, is so loosely defined here as to lose all meaning. But the precedent and standing law cited here, all Bush-era, isn’t so flimsy that it can’t survive in court. David Kravets has the best, contextualized take on the memo that I’ve seen. UPDATE: This is what I mean by hypocrisy – a 2007 interview that Obama gave to Charlie Savage, the elder statesman of the presidential overreach beat. I agree with the Supreme Court’s several decisions rejecting the extreme arguments of the Bush Administration, most importantly in the Hamdi and Hamdan cases. I also reject the view, suggested in memoranda by the Department of Justice, that the President may do whatever he deems necessary to protect national security, and that he may torture people in defiance of congressional enactments. In my view, torture is unconstitutional, and certain enhanced interrogation techniques like “waterboarding” clearly constitute torture. And as noted, I reject the use of signing statements to make extreme and implausible claims of presidential authority. He’s simply not living up to that, but this in itself isn’t a devastating case against targeted killing.